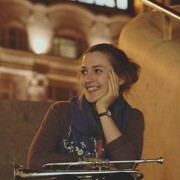 Sarah is a London-based classical trumpeter who loves delighting audiences with the sound of classical brass. In 2014 she was awarded a Trinity College London scholarship to study trumpet with Tony Cross, Robert Farley and Andrew Hendrie at Trinity Laban Conservatoire of Music & Dance. In 2016 she received an EU ERASMUS scholarship to study with Professor János Kirsch at the Franz Liszt Academy of Music in Budapest. In 2017 she participated in the International Brass Masterclass at the Sibelius Academy in Helsinki, further developing her trumpet technique with Pasi Pirinen, Urban Agnas, Tom Poulson and John Miller.